MANILA, Philippines - State weather bureau PAGASA in an update released on Sunday morning (December 7, 2014) as of 5am said that Typhoon Ruby (international name:Hagupit) has slightly weakened and is now in the vicinity of Catbalogan City, Samar. The expected second landfall of Typhoon Ruby is in the vicinity of Masbate and it will be associated with strong winds, storm surge (up to 3 meters) and heavy to torrential rainfall. The estimated rainfall amount is from 10 – 30 mm per hour (heavy – torrential) within the 500 km diameter of the typhoon. Typhoon Ruby and the Northeast Monsoon will bring rough to very rough sea conditions over the seaboards of Luzon and Visayas and over the northern seaboard of Mindanao. Fisherfolks and those using small seacraft are advised not to venture out over the said seaboards. 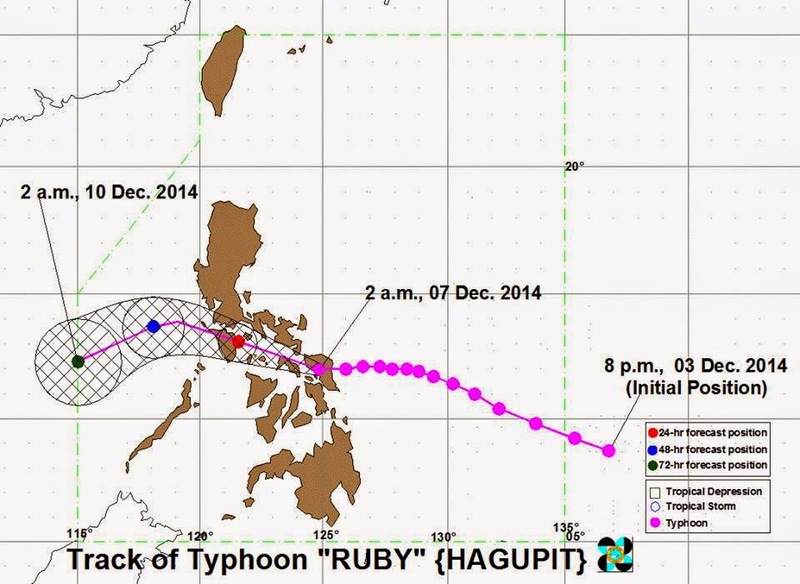 PAGASA has revised the expected exit to PAR of 'Ruby' and said it's on Wednesday early morning (December 10). At 4:00 AM today, the eye of Typhoon “RUBY” was located based on all available data including Virac and Cebu Doppler radars in the vicinity of Calbayog City or at 40 km Northwest of Catbalogan City, Samar (12.0°N, 124.6°E). 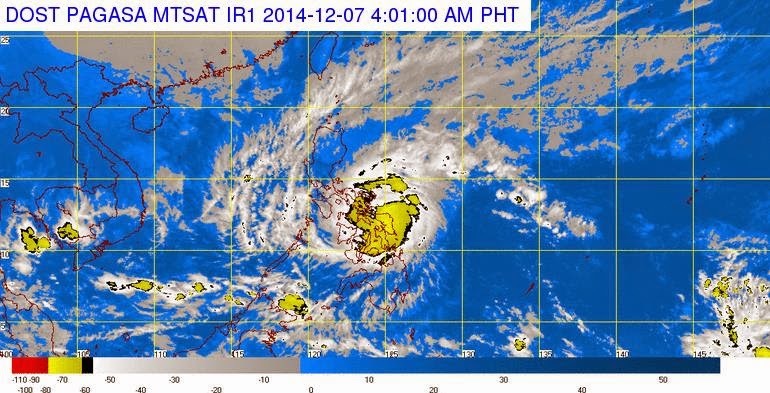 It has maximum sustained winds of 160 kph near the center and gustiness of up to 195 kph. It is forecast to move West Northwest at 15 kph. VISAYAS: Northern Samar, Eastern Samar, Samar, Leyte and Biliran. Residents in low-lying and mountainous areas are alerted against flashfloods and landslides. Likewise, those living along the coast are warned on the occurrence of big waves associated with Storm Surge which may reach up to 3 meters. VISAYAS: Rest of Antique,Rest of Iloilo, Guimaras, Negros Occidental, Negros Oriental, Rest of Cebu and Bohol. MINDANAO: Surigao del Norte including Siargao Island and Dinagat Province.